The headlines across the globe yesterday were lit up with news of Pope Benedict XVI’s impending resignation, but on U.S. networks, another interesting story appeared, which concerned the man from SEAL Team 6 who fired the shots that killed Osama bin Laden. The online publication of Esquire‘s sprawling 15,000-word feature is the first time the “Shooter” has told his side of the story, and its details make for an interesting read to say the least. 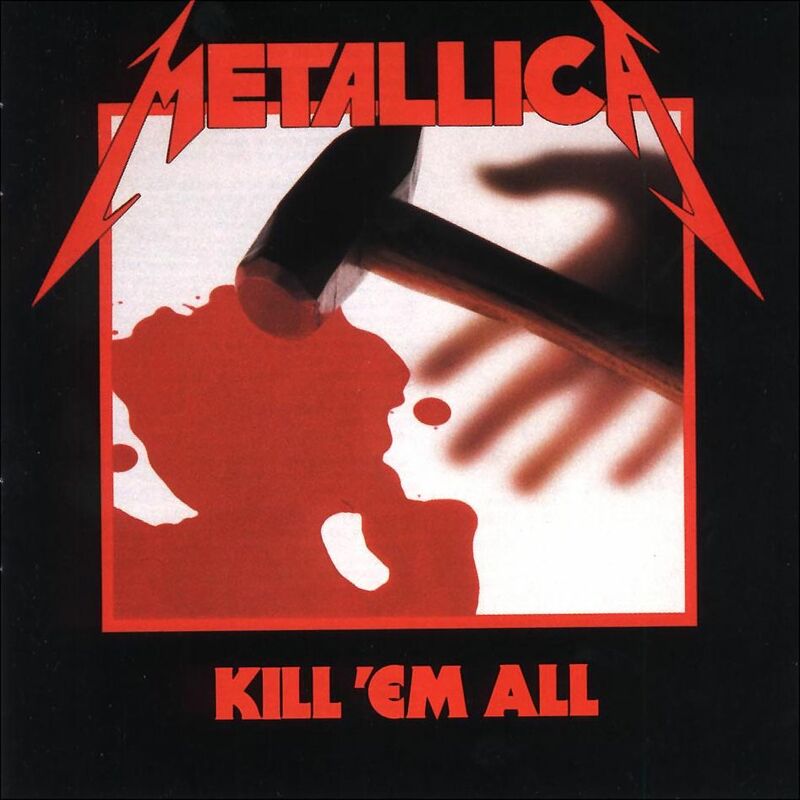 When we first started the war in Iraq, we were using Metallica music to soften people up before we interrogated them … Metallica got wind of this and they said, ‘Hey, please don’t use our music because we don’t want to promote violence.’ I thought, Dude, you have an album called Kill ‘Em All. 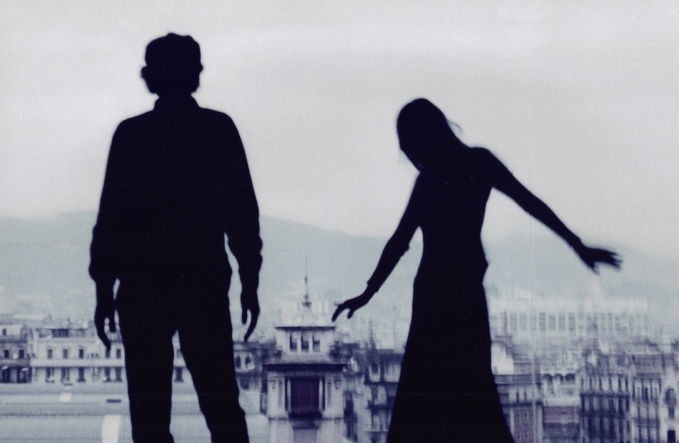 Two things Beatle-related have happened in the last day or so, one saddening and one possibly maddening. First, master sitarist Ravi Shankar has died at the age of 92, leaving behind a staggering legacy of musical genius that seemed to touch a majority of the keystones of modern Western music. A statement released by his family stated that Shankar died in San Diego after having undergone heart-valve replacement surgery to aid upper respiratory and heart problems. December 21st is the date that the label has chosen for their desert freakout, which will most likely play out like Coachella without the damned teenyboppers or maybe even (if you’re lucky) the dark side of Burning Man. On the bill are SB staples Psychic Ills, who will probably bring their Spacemen 3-brand opium den pillows, and twisted sonic temptress Zola Jesus, who I’m told will perform her set on a white satin sheet billowing in the desert wind. While I know less about some of the other artists performing that night, listening to some of their work has me convinced the show will be out of this world. Pop. 1280 has a gritty edge that sounds like the no wave offspring of Trent Reznor and a grizzly bear, and Wymond Miles‘ reverb-soaked verses seems to always be singing the sad song that’s plays you off into the night. A few of these artists (as well as some that work regularly with SB) can be found on Todo Muere, Vol. 2, which is the label’s Record Store Day compilation from 2012. Check out Sacred Bones’ Facebook page for info on the event and get tickets from the label’s site. 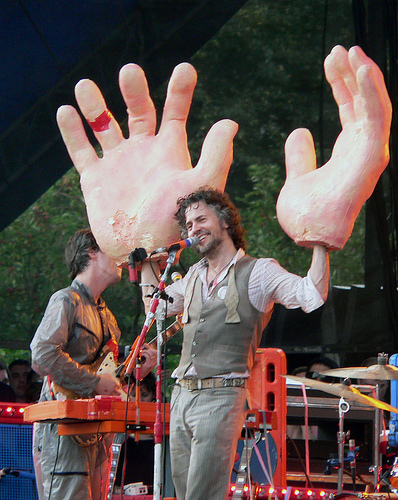 Wayne Coyne on stage with large hands. … by adding a deactivated frag grenade to his carry on luggage. Apparently, Coyne, the lead singer for the Flaming Lips, took the grenade, a party decoration which was gutted and painted gold, and nonchalantly tossed it in his bag. Of course, when the bag went through security at Will Rogers Airport, alarms went off and the terminal was shutdown until it was determined that the grenade was harmless. You might know Coyne as the mastermind behind “7 Skies H3“, the Lips’ 24-hour-long song, or the Gummy Song Skull/Fetus releases, where USB drives containing mp3s were encased in an edible gummy brain and fetus, respectively. 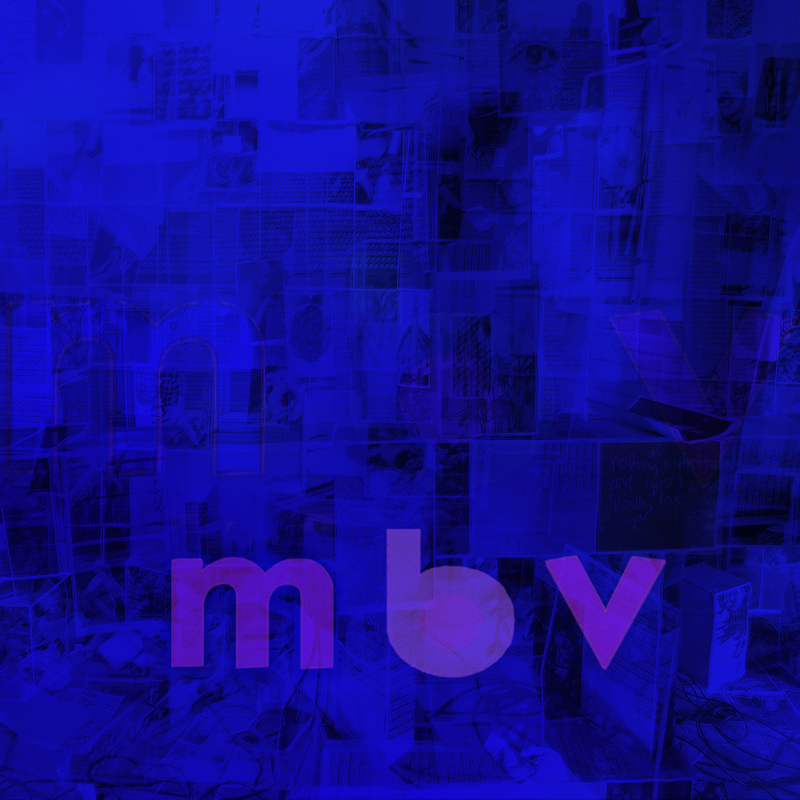 The band is also known to be active on Twitter, where they’ve made a common practice of actually conversing with their fans, and at least once appearing at one’s house party for an impromptu performance. These past events might lead one to believe that the grenade debacle was part of another stunt, but according to Coyne, it wasn’t at all. The singer took back to his Twitter account to say, “Sorry Sorry Sorry!! Everyone that was inconvenienced because of my grenade at OKC airport! !” — a line that sounds uncannily like just another non-sequitor in Coyne’s standard on-stage banter. In case you folks didn’t know, Billy Corgan loves cute furry animals. He also loves his hometown of Chicago. 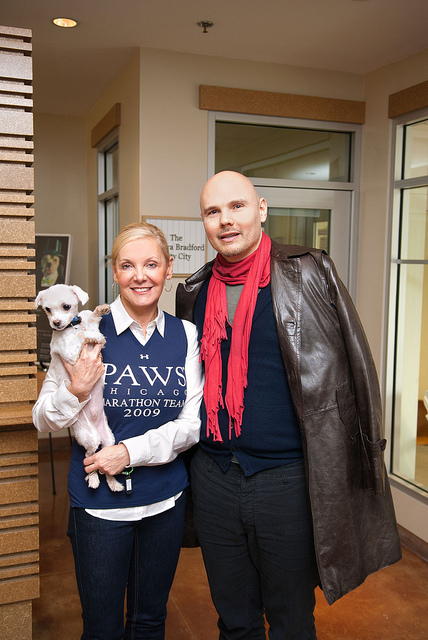 When you put the two together, you get PAWS Chicago, ostensibly the city’s most famous no-kill shelter, and when you throw in the Smashing Pumpkins frontman into the mix, you get a private performance for four to be auctioned off at the PAWS Fur Ball. The 11th Annual PAWS Chicago Fur Ball, which is slated to happen tomorrow night, November 9, is a ritzy black tie event that draws big names in both guests and benefactors, which shows in the steep price tag on ticket prices — $400 per person and $250 for guests under 35. You are afforded an option that is rare in events such as this, though: you can bring your pet (for an additional $100 per wagging tail). All proceeds from the event will go towards funding PAWS Chicago’s efforts. Corgan, who is always public about his love for Chicago, is no stranger to public appearances in Chicago, where he is known as an avid sports fan and occasionally attends Cubs games. He is also a long-time source of rock-god controversy as of late, going on the record about past suicidal tendencies and his anger towards modern rock posturing. It’s good to see, though, that Corgan has his eye on altruistic pursuits such as the Fur Ball. The private performance itself will be at the BIC-headed troubadour’s 1930s-styled tea house, Madame ZuZu’s in Highland Park, which opened in September. The question now is how much ball’s attendees will actually fork over for the auction item and if they can bring their pets too.